Kerunne Ketlogetswe, MD, a non-invasive cardiologist at MedStar Harbor Hospital, is board certified in internal medicine and cardiology. 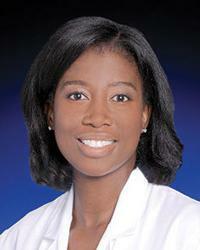 She diagnoses and treats common heart problems, including heart attacks and other acute heart conditions. She considers herself an active health partner with her patients, helping to support their recovery and guiding them to improved heart health. In her practice, she provides both preventive care and treatment of heart disease and values the relationships she develops with her patients. An important part of her role is teaching her patients how to live a heart-healthy lifestyle and preventing heart disease from occurring. She believes everyone can make changes to prevent heart disease whether it's making dietary changes, or setting a goal to walk 10,000 steps each day. Dr. Ketlogetswe received her doctor of medicine from Harvard Medical School and completed her Master's degree in Health Science in Cardiovascular Epidemiology at The Johns Hopkins Bloomberg School of Public Health. She completed her residency in Internal Medicine at Brigham and Women's Hospital and completed her fellowship in Cardiovascular Medicine at The Johns Hopkins Hospital. In addition to seeing patients, Dr. Ketlogetswe is an adjunct faculty member at the Johns Hopkins Bloomberg School of Public Health. She has served as investigator and co-investigator on research studies and has been published in journals including Circulation, Clinical Chemistry and others. She is a member of the American Heart Association, American College of Cardiology and American Society of Preventive Cardiology.